Update:Click here to download the Lights Coding Activity sheet used in the workshop! This hands-on and engaging tech event will have creative activities for two age groups. Light up a Halloween costume (or other fabric of your choice) by creating interactive e-textile circuits with a LilyPad LilyMini Protosnap and conductive thread. 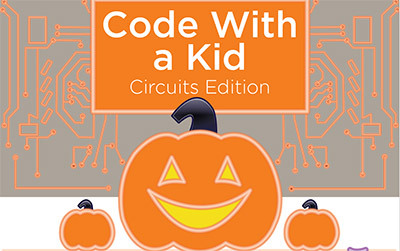 You and your kiddo will learn how circuits work and how to design your own on a costume. LilyMini and conductive thread provided; you must provide the costume/fabric for your child. An adult must accompany the child to for this activity. Limited to the first 30 registrants! This group will be in Student Building Room 231. We will have hands-on STEM activities for kids ages 5-8. If you have more than one kiddo in attendance, not to worry! Please accompany the child in the costume session, and we'll provide background-checked educators for the 5-8 year old room. This group will be in Student Building Room 015. This workshop is part of the Institute for Digital Arts and Humanities Making the Arts & Humanities 2017-2018 theme and is presented jointly with the Center of Excellence for Women in Technology (CEWiT) and Creativity Labs.